Struggle icon Winnie Madikizela-Mandela will be buried on April the 14th during an official funeral. President Cyril Ramaphosa made the announcement on Monday night outside the struggle stalwart’s home in Soweto. Madikizela-Mandela died at age 81 at the Milpark Hospital in Johannesburg. “We have declared that Winnie Mandela will have a national official funeral which will be on 14 April and an official memorial service on the 11th. But then again there will be many other memorial functions right across the country in nearly every province of our nation,” Ramaphosa said. The ANC secretary-general Ace Magashule says the party’s flags will fly at half-mast as a sign of mourning for ANC stalwart Winnie Madikizela-Mandela. Magashule says Madikizela-Mandela belonged to all around the world. Magashule says the party has lost a loyal and trusted member. “Mama Winnie as she was popularly known would have celebrated her rich age of 82 in September this year but it was not to be, we therefore mourn the passing of this great patriot and Pan African whose resilience on courage inspired freedom fighters not only in South Africa but across Africa and the Diaspora. “Comrade Madikizela dedicated her live to the betterment of our people and she worked for the realisation right until the end of her life. May her spirit lives on Winnie Madikizela Mandela,” Magashule said. Archbishop Emeritus Tutu and his wife Leah have sent their condolences to Madikizela-Mandela’s family following news of her passing. In a statement, Tutu has wished her a peaceful rest. He says for many years Madikizela-Mandela was a defining symbol of the struggle against apartheid. Tutu says she refused to be silenced by the imprisonment of her husband, perpetual harassment by apartheid police and numerous detentions and bannings. Tutu says Madikizela-Mandela’s courage was deeply inspirational to him and other activists. 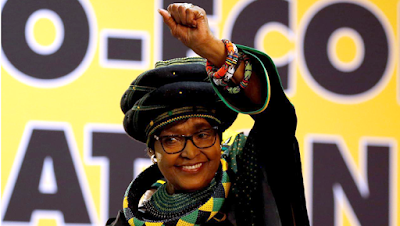 ANC veteran, Pallo Jordan says Winnie Madikizela-Mandela has left a void in the political arena of this country. In a statement, Parliament says the Presiding Officers of Parliament which are National Assembly Speaker Baleka Mbete and National Council of Provinces Chairperson Thandi Modise, have expressed shock and collective grief at the passing-on of a veteran MP. Speaker Mbete and Chairperson Modise say Madikizela-Mandela fought against apartheid and defended the rights of the poor, especially women. As one of the pioneer MPs, she paved the way for what the Parliament of South Africa has since become. UDM leader Bantu Holomisa has paid an emotional tribute to the late Winnie Madikizela-Mandela. He says she was often a controversial figure. Holomisa however says whether one agreed with Madikizela-Mandela’s views or not, she must be admired for sticking to her convictions. DA leader Mmusi Maimane has described Madikizela-Mandela, as someone who was willing to stand up for the truth. Winnie Madikizela Mandela will be remembered as a pioneer and trailblazer. In 1955, she was appointed the country’s first black social worker. She had been given the task to head up the social work programme at the biggest hospital in the southern hemisphere – the Baragwanath. Former Independent Electoral Commission chairperson, Brigalia Bam, had been mentored by the struggle icon at the Jan Hofmeyr College.